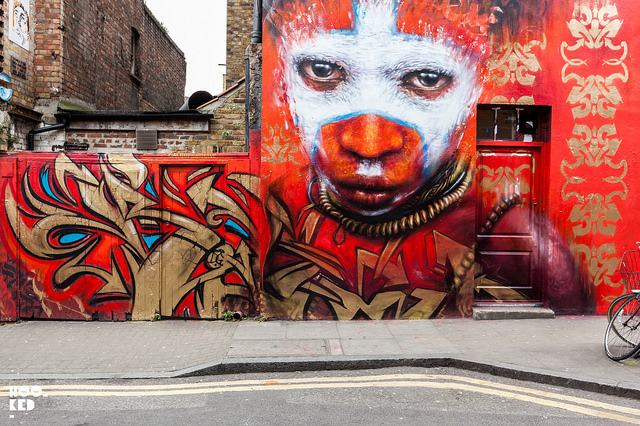 Hookedblog recently caught up with London artist Dale Grimshaw (Previously on Hookedblog) as the artist began working on a new large scale mural on Hanbury Street, just off the bustling Brick Lane. We have previously featured Grimshaw's work on the site on a number of occasions, with the most recent being this #E17 mural he painted for Wood Street Walls on the wall of the Hurricane Rooms at the junction of Hoe Street and Forest Road in Walthamstow. 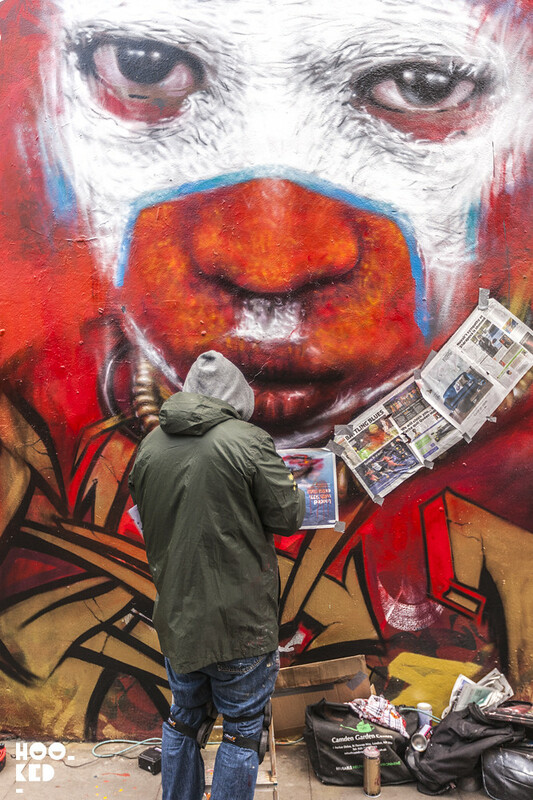 For his latest work Grimshaw has selected a strong colour palette, a mix of rich reds & regal golds for the mural with him again choosing to focus on the People of Papua New Guinea. As with some of the artists more recent works this piece has also been painted in support of the Free West Papua Campaign. 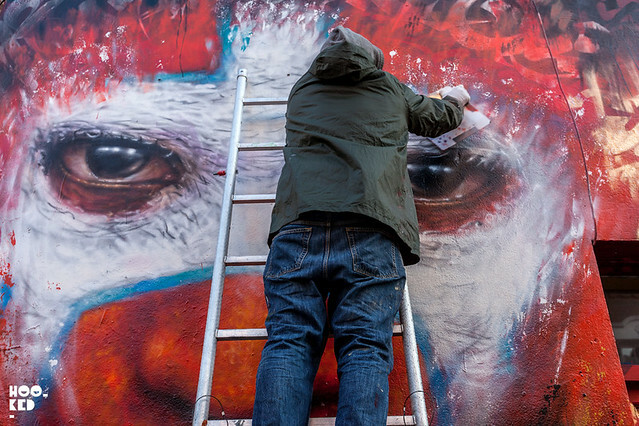 According to Dale the mural is based on 'An image from Papua New Guinea', but is a 'dedication to the people in West Papua that are illegally occupied by the Indonesian Government'. You can read more about the Free West Papua Campaign that Dale is supporting via their website. 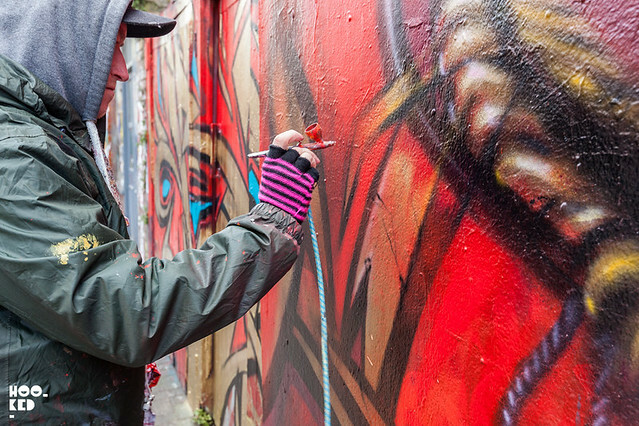 Dale Grimshaw using an airbrush combined with spray paint to achieve some of the super fine lines on his work.